FEATURES: Sturdy white plastic hull holds all interior engine parts with no cover. Interior parts include a crank arm, gear box, switch lever, AA battery, link rod, and a square styrofoam float. Two 6-1/2" orange moving oars. Boat will turn left and right. Also includes grease for lubrication, vinyl tubing, hex shaft, a battery terminal, and small phillips screws. Pictorial instructions. Relaxed Swimming ActionThis fish robot swings its tail from side to side while swimming along. The main body stays underwater while the dorsal fin protrudes when it swims. 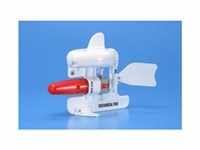 The Submarine Motor Mini and Underwater Gearbox move the tail via a crank and linkage rod mechanism. 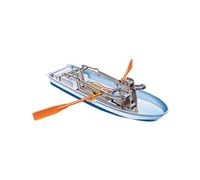 The main body, fins, and foam float are all conveniently included in this easy to assemble set. Tamiya and mechanical fish logos as well as two kinds of eye stickers are included. Enjoy the Action!The fish robot can swim not only in straight lines but also in circles by changing the angle of the tail fin. To change the angle, simply lift the tail fin then reposition to the right (clockwise swimming) or left (counter clockwise swimming). Slightly or greatly adjust the tail fin angle for the fish to swim in large or small circles. Furthermore, the swimming posture of the fish can also be adjusted by changing pectoral fin position. 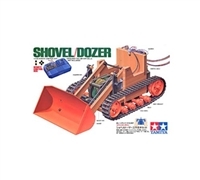 This is a Power Shovel/Dozer Assembly Kit from the Educational Construction Series by Tamiya. FEATURES: By using three powerful electric motors, this action shovel/dozer can move forward/reverse, steer right and left, and the load bucket can be controlled up or down. Chassis/frame and bucket arms are made of pre-cut wood pieces and are easy to assemble. A 3-channel remote control box is included. Includes three motors. Orange plastic load bucket and road wheels Realistic flexible black tracks. Detailed pictorial instructions. INCLUDES: One Power Shovel/Dozer Assembly Kit. 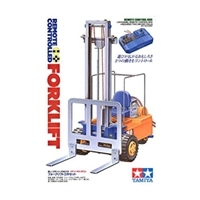 This is a Remote Control Forklift Kit from the Educational Construction Series by Tamiya. FEATURES: Uses three motors to simulate the movements of a full sized forklift. Forward/reverse movement, steering and lift operation can be controlled by a 3-channel remote control box. Silver metal forks and masts. Yellow and blue plastic body. Black tires with high-grip tread pattern. Can lift up to 100g weight. Forks are moveable up to 20cm height. Includes a palette to assemble and use. Detailed pictorial instructions. INCLUDES: One Remote Control Forklift Kit.